It is definitely the road less traveled. A bumpy, gravel path in a remote part of Maricopa County. It seems like the road is leading to nothing but it actually takes you right to an oasis for wildlife - one of the state's water catchment sites. 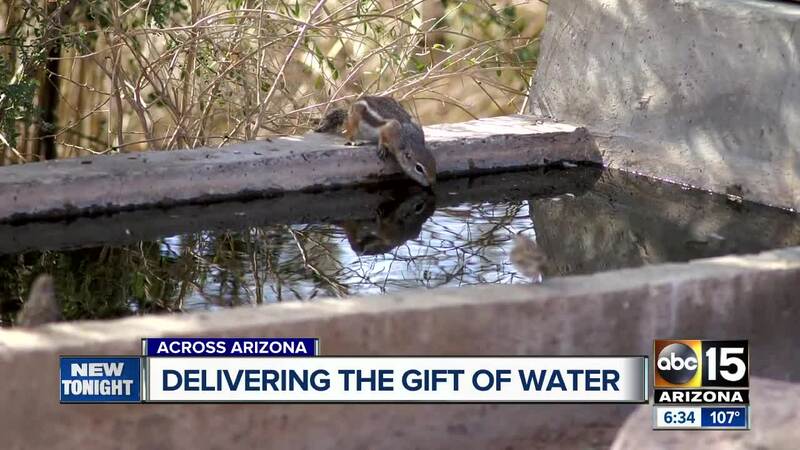 Arizona Game and Fish maintains a couple thousand of the sites scattered across remote parts of Arizona - basically man-made watering holes for wildlife. "It's to collect the precipitation, the rain or whatever and get it into the tank," said Joseph Currie, the department's Habitat Planning Program Manager. Currie says the massive medal apron, strategically placed in the open desert, is supposed to catch the rain and store it in massive tanks underneath the structure. It then slowly releases water into a trough for the animals to drink. The problem is Arizona hasn't had rain and the tanks are going dry. "Since about like October, we're like minus five inches so that's literally thousands of gallons that would have been in the catchment that aren't there," said Currie. 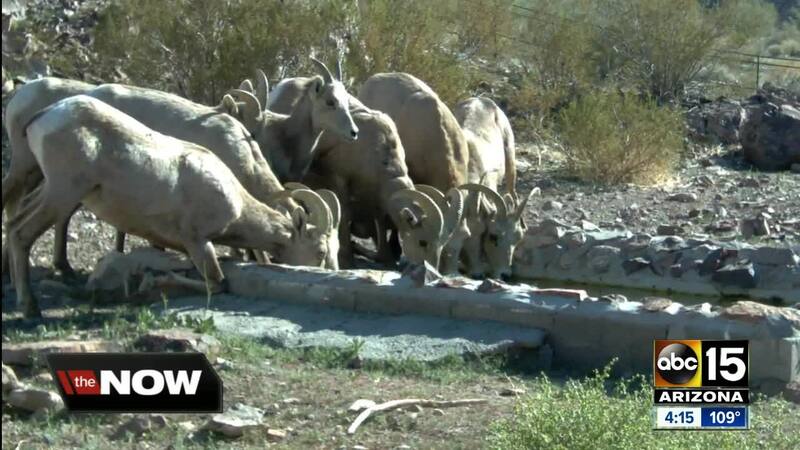 So now the state is taking on a massive undertaking, hauling water to the animals and in some cases even air-lifting water to mountain tops for big-horn sheep. On a hot-dry triple digit day, Game and Fish is pumping 1,700 gallons of water into the holding tanks. When it comes to water, there's very few options for animals otherwise. "They would have to die off or they move if they can," said Currie. The system does work. Game and Fish captured photos of thirsty bears, mountain lions, elk, deer, even tiny critters - all getting a much needed drink. "The drier it gets, the further they search for water and that's going to lead them to town," said Currie. Currie says that's part of the reason why the Valley is seeing more wildlife in town this year. The animals are desperate and searching for water. By hauling water to them, hopefully the animals will stay in the wild and survive. Currie says hauling water to remote parts of Arizona is expensive. Hauling water to mountain top with a helicopter can easily cost several thousand dollars. If you would like to help provide drinking water for the animals, text SENDWATER to 41444. There is no minimum donation.